we have 1 of these Samsung SL-M2024w laser printers in stock. When we receive more, price will be up to $30 higher. . 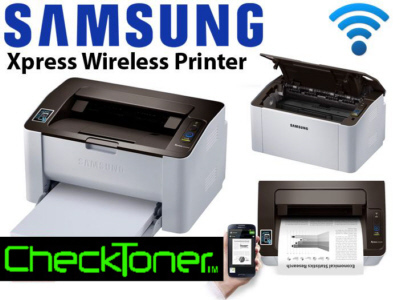 NOTE: We have 278 MICR toner cartridges in stock for this & other Samsung printers. • Our MICR toner for Samsung SL-M2020w CAN be used to print like regular Samsung SL-M2020w toner. Already have a Samsung Model ML-1210, ML-1630 ML-1640, ML-1660, SL-M2020w, ML-1710, ML-1740, ML-2240, ML-2150, ML-2250, ML-2510, SL-M2020w, SL-M2020, M2024w, ML-3560, SCX-4600, SCX-4623F, SF-650, SF-650P, 1210, 1250, 1430, 1630, 1640, 1710, 1740, 1750, 2010, 2150, 2151, 2250, 2510, 3560, 5530, SCX-4216, SCX-4100, SCX-4500, SCX-4826, SCX-5530, CLP-300, CLP-500, CLP-510, CLP-600, CLP-610, CLP-650 or ML-6060 ... Order a cartridge. We have them in stock for immediate delivery. We can also supply MICR cartridges for most Samsung, Hp, Dell, Xerox, Lexmark, Okidata, IBM and Canon laser printers. Just Email your make & model and we'll promptly quote you a price.